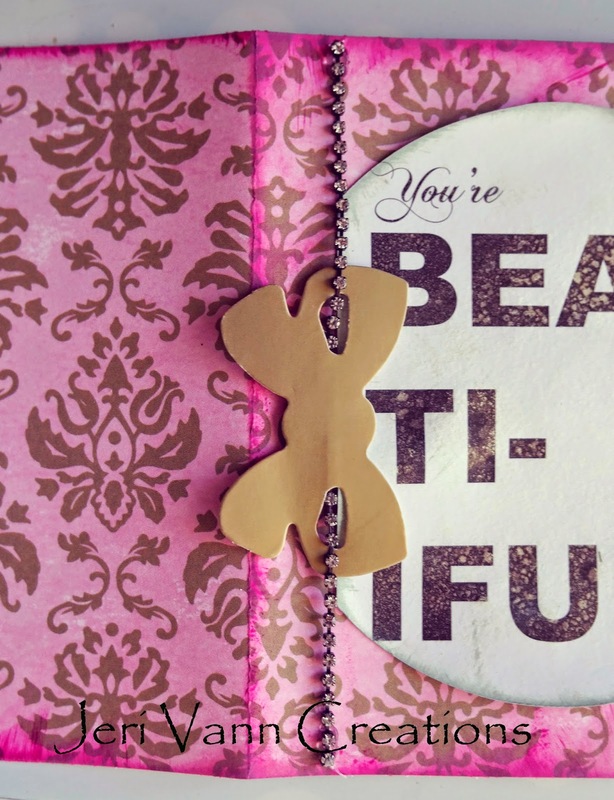 Find the Ritz Vrocade Sheet and the ‘Beautiful’ section of the Bits & Pieces Sheet. 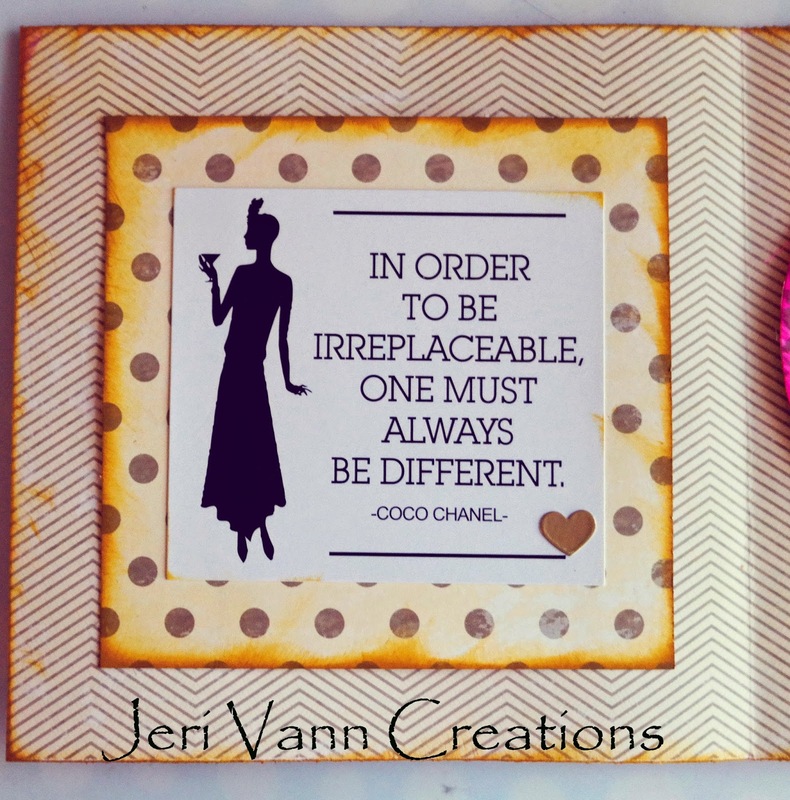 Cut the ‘Beautiful out and use a circle template or circle cutter to cut it into a 4” circle, and leaving the left side straight. 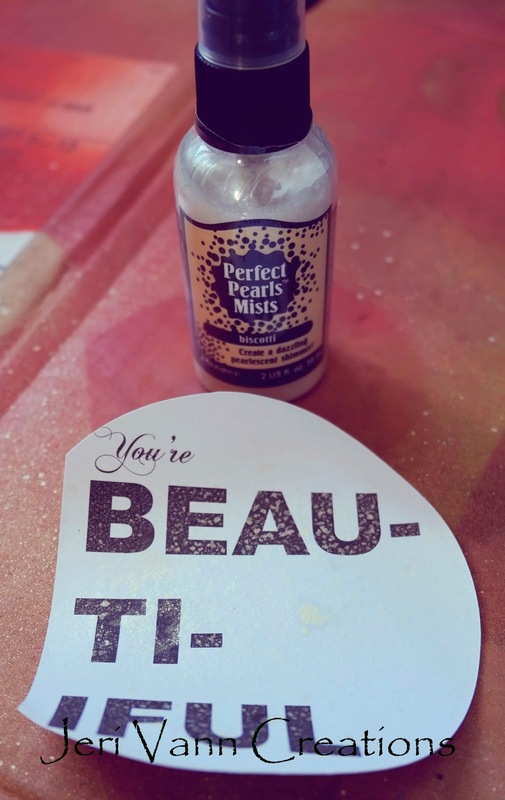 Spray the ‘Beautiful’ circle with the Biscotti Pearls Mist. Set aside to let dry. Cut a 10” x 5” piece out of the Ritz Vrocade Sheet. Fold in half. 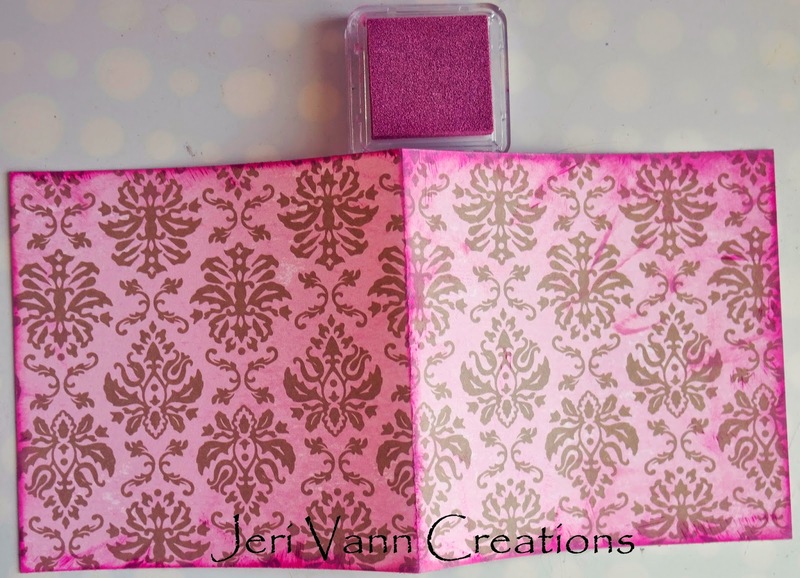 Using a bright pink ink pad, ink the edges of the card and down the center fold. 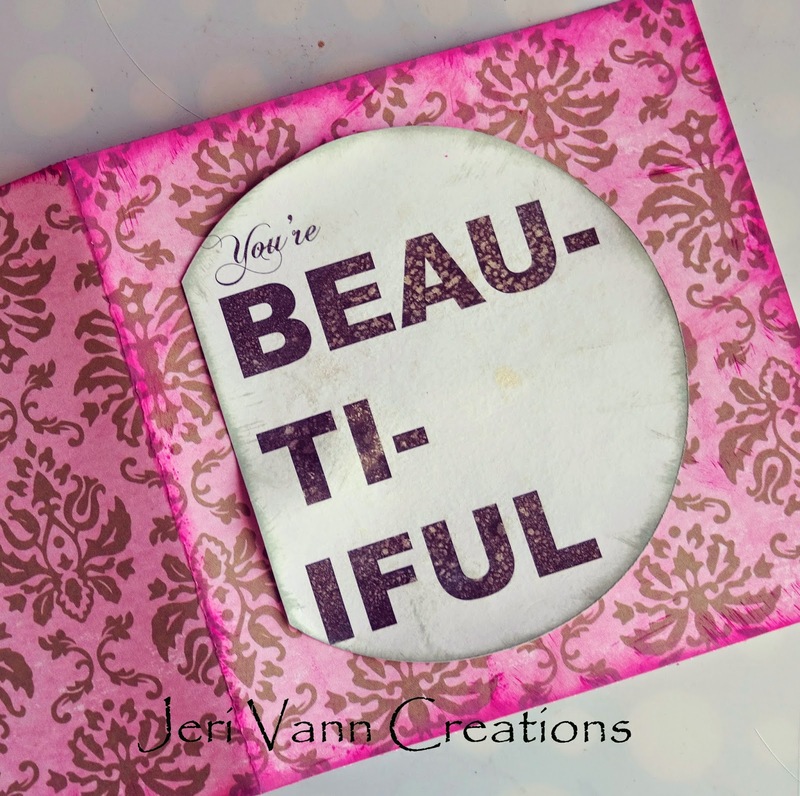 Using a lighter pink ink pad, ink all edges, over the bright pink ink. This will blend the color more, and smooth any hard lines the bright pink might have made. 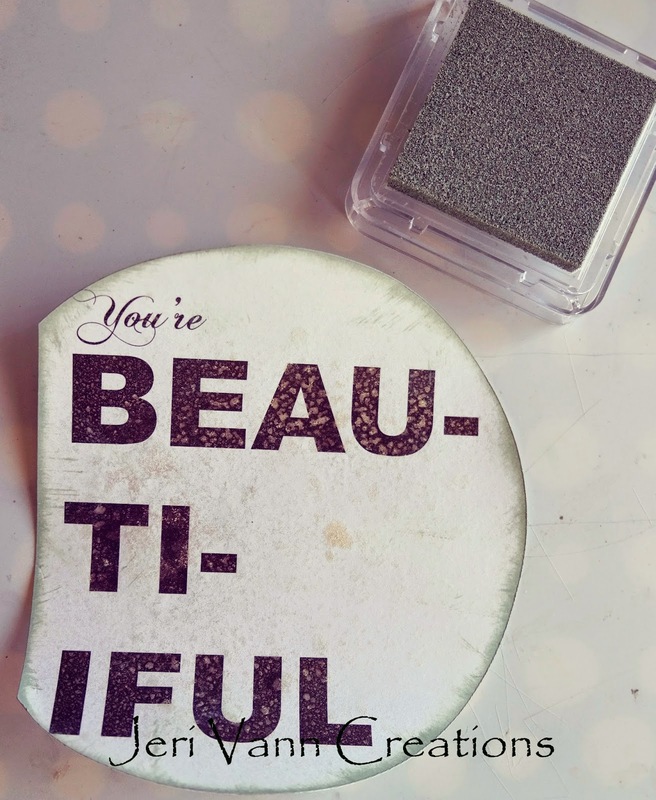 Once the ‘Beautiful’ circle is dry, using a light teal shade ink pad, ink all around the circle. ht have made. 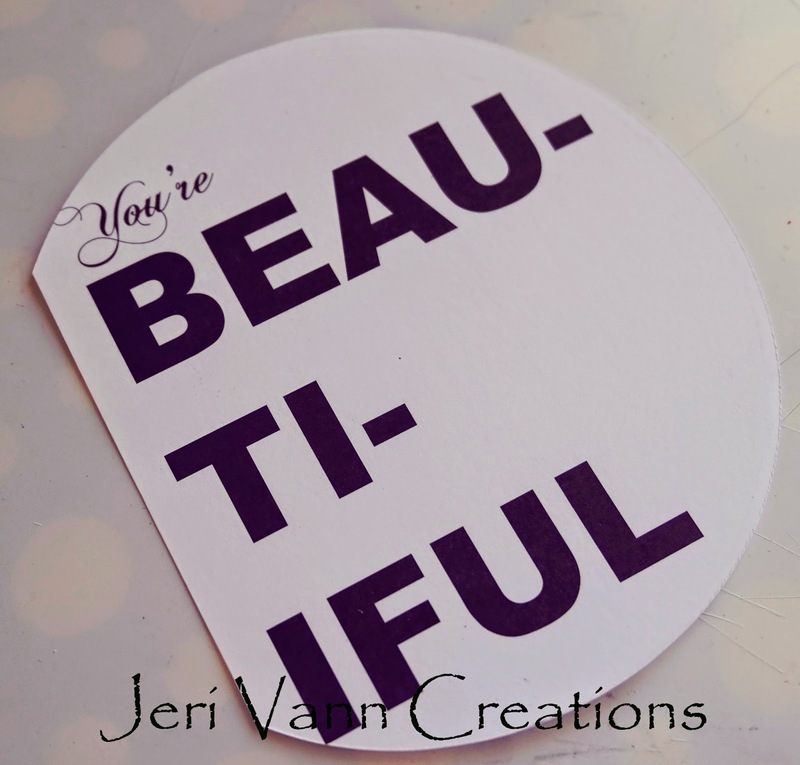 With double sided tape, secure the circle on the front of the card, ½” in from the left side fold. t have made. Grab your Rhinestone Strand, thread it through the Gold Whatnots Bow. With hot glue, secure the Rhinestone strand along the straight side of the ‘Beautiful’ circle. Make sure to cut the strand to fit the height of the card. 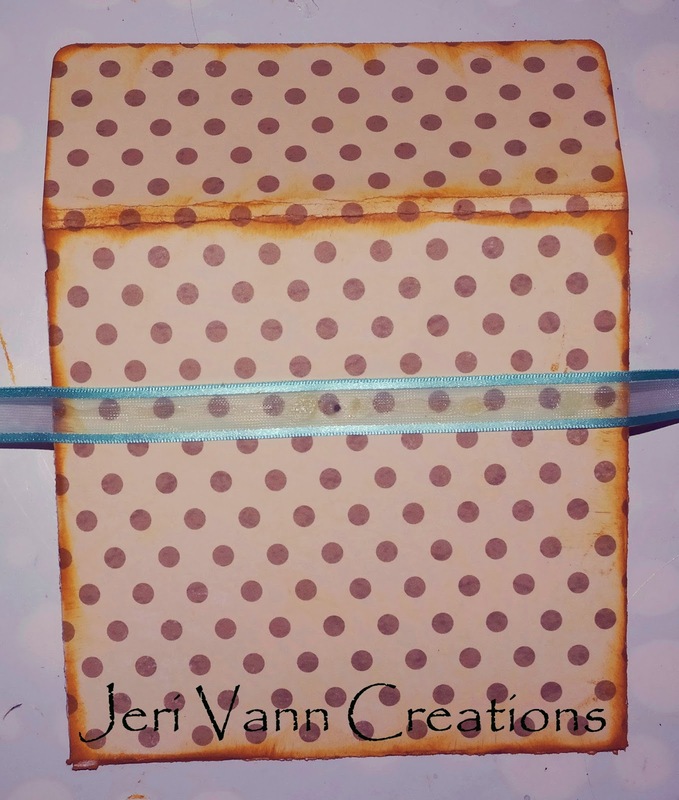 Be careful when hot gluing, and just use a tiny dot, so it doesn’t spread when pressing the strand to the card. Stick the Gold Bow Giant Rhinestone to the Gold Bow Whatnots center. Cut the Lined Bow section of the Bits & Pieces Sheet. Cut a 4” circle out of the Ritz Vrocade Sheet. 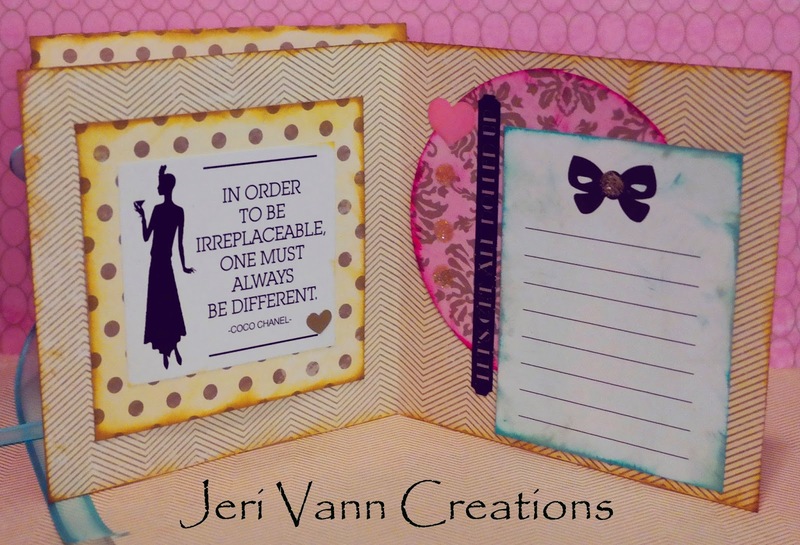 Using a gold ink pad, ink all edges of the inside of the card. 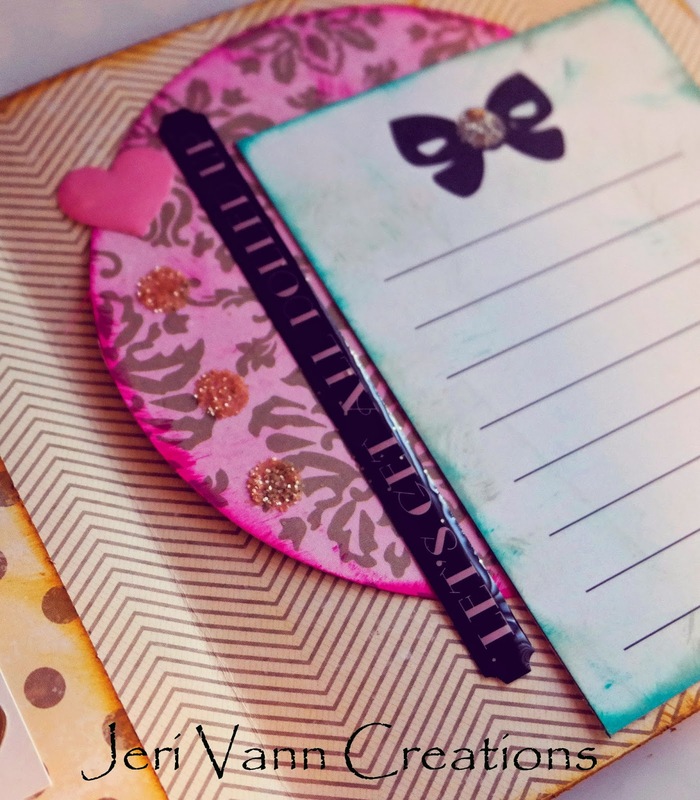 With the bright pink ink pad, ink the circle. 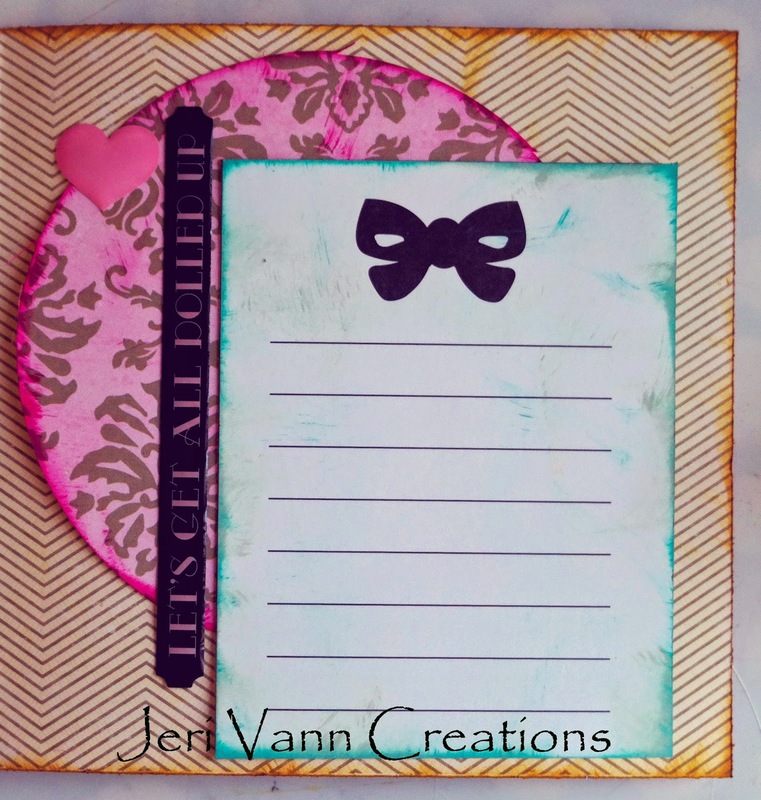 Using bright and light teal ink pads, layer up inking edges of the Lined Bow card. 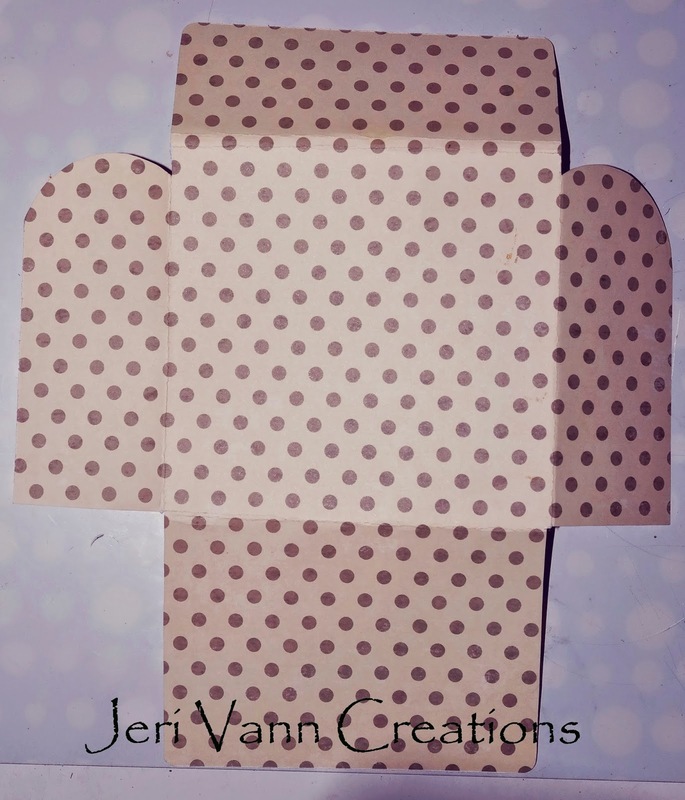 Cut out a 3.75” x 4.75” piece out of the Rich Stripe Sheet. Ink the edges with a gold ink pad. Place the Coco Chanel Sticker to the piece, centered. 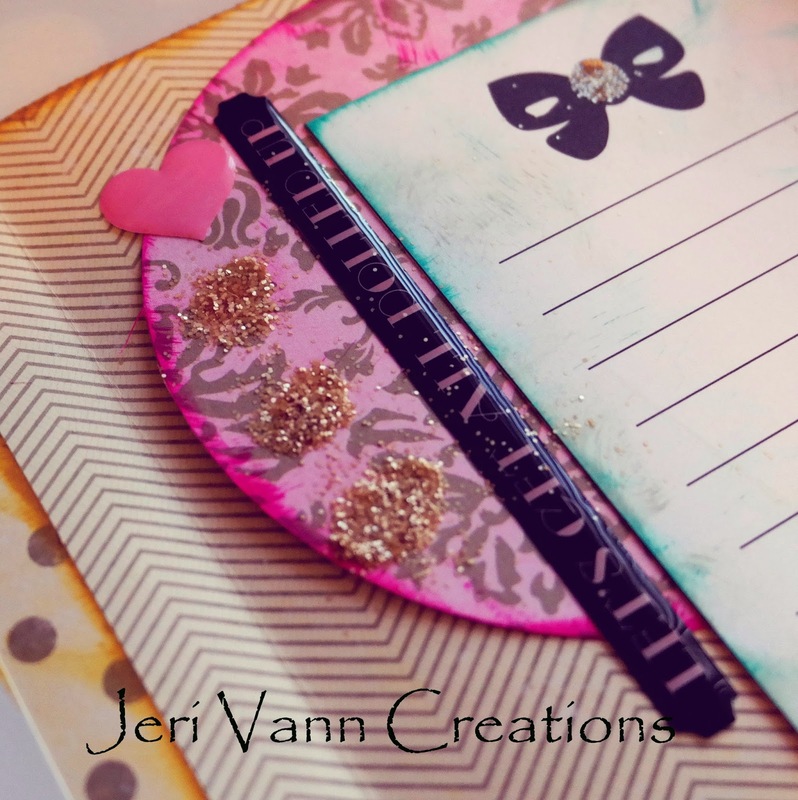 Using double sided tape, secure it, centered, to the right side of the inside of the card. 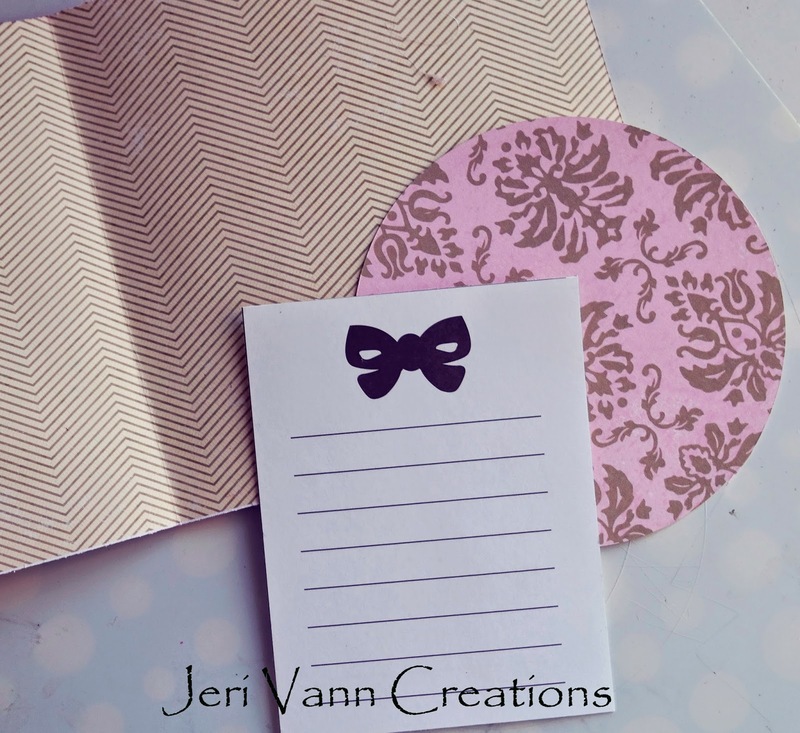 Using double sided tape, secure the circle and the Lined Bow card to the right side of the inside of the card. 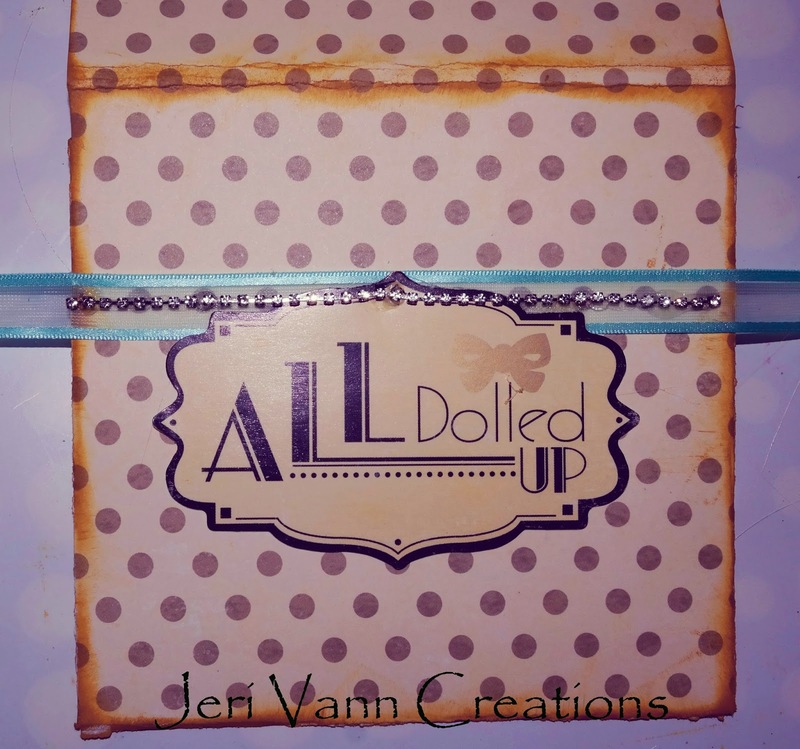 Stick the ‘Let’s Get All Dolled Up’ Puffy Word, vertical along the left side of the Lined Bow Card. 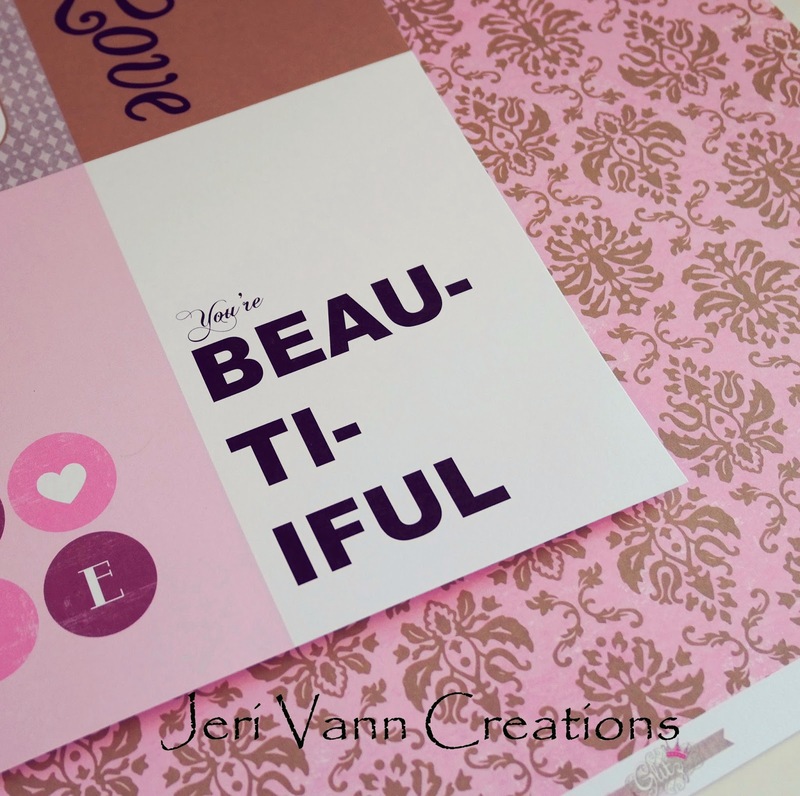 Add the Pink Heart Puffy Word to the left side of the word strip. Place Glue Circles on the center of the Bow, and down the left side of the circle. 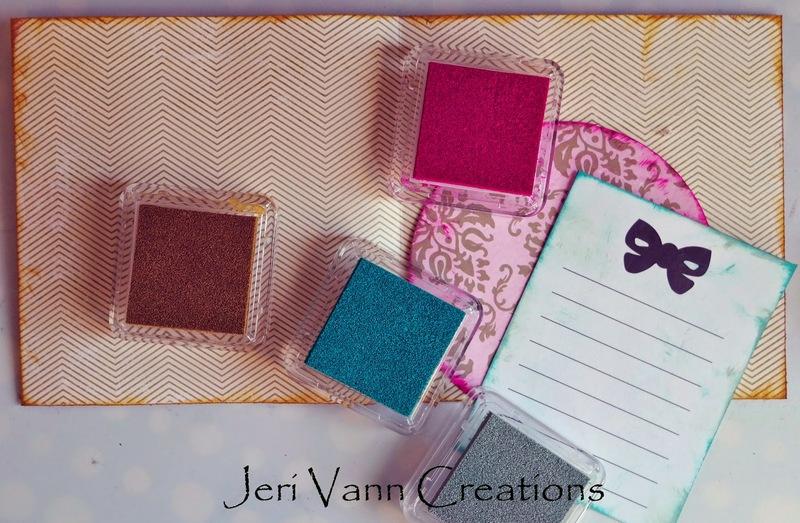 Sprinkle some of the Antique Linen Distress Glitter on them. Press down with your finger so it covers the full glue circle. Find the Rich Stripe Sheet. Cut a 11” x 9” piece. Place the card in the center of the sheet and trace it. 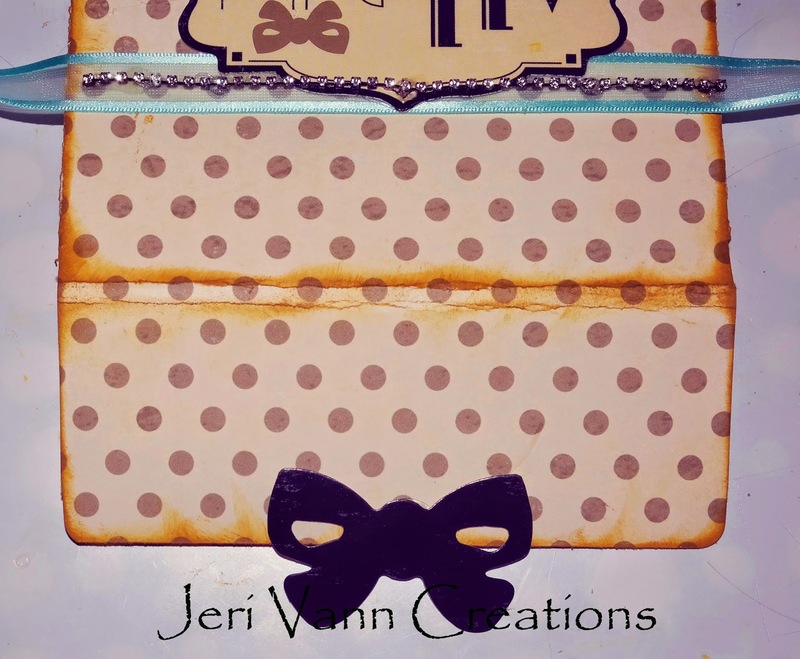 Create the envelope however you think fitting. 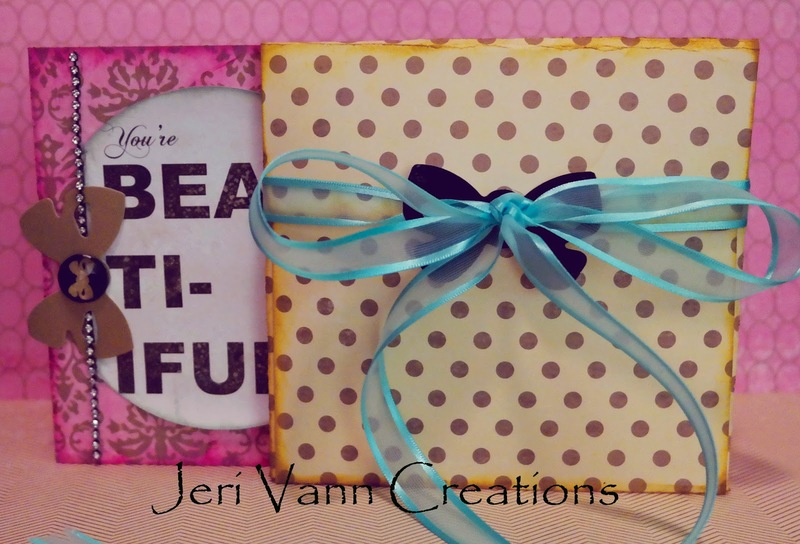 I created the envelope so the side panels are 2” in width, bottom flap is 3.5” and the top flap is 2.5”. 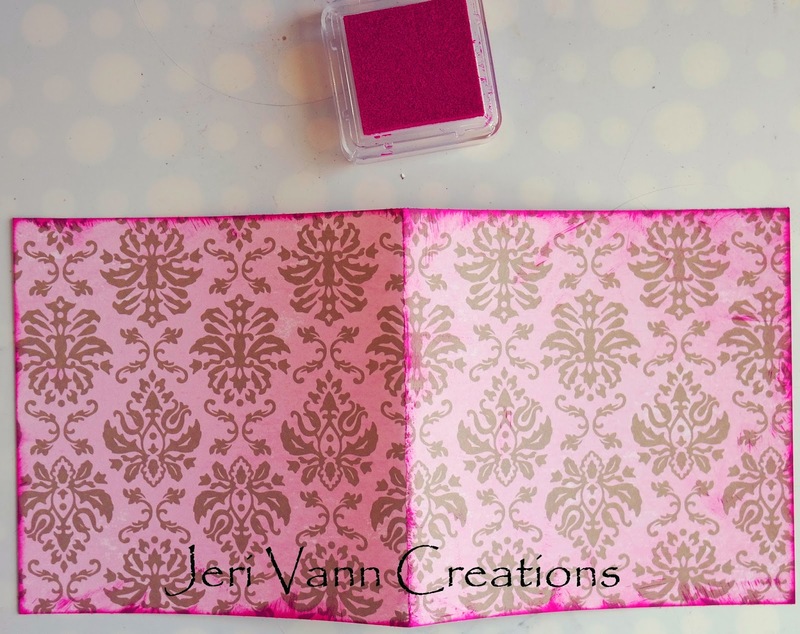 Cut out the corners of the envelope, and use a straight edge to fold in the flaps. Because of the height of the Giant Rhinestone on the card, I placed this inside the envelope, just to make sure there was enough space to slide it in. 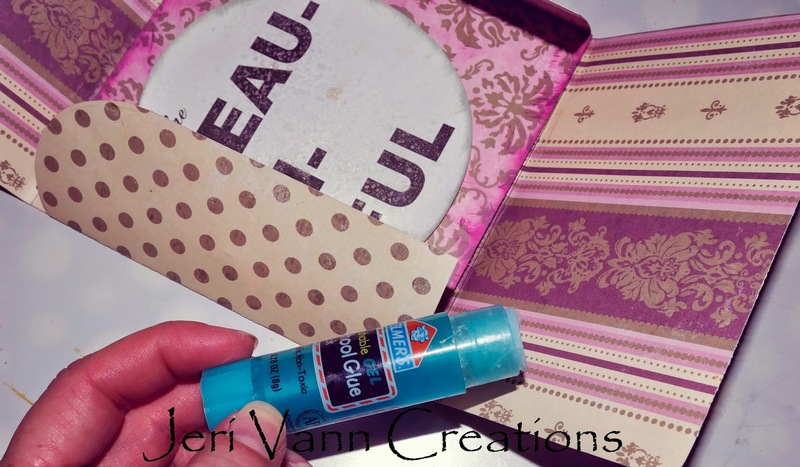 Using a gluestick, secure the bottom flap to the side flaps. Smooth out with your fingers until they hold. Choose some matching ribbon that will fit through the holes of the Black Whatnots Bow. Cut a piece of ribbon, between 30” to 40”. Hot Glue the center of the ribbon across the front of the envelope. 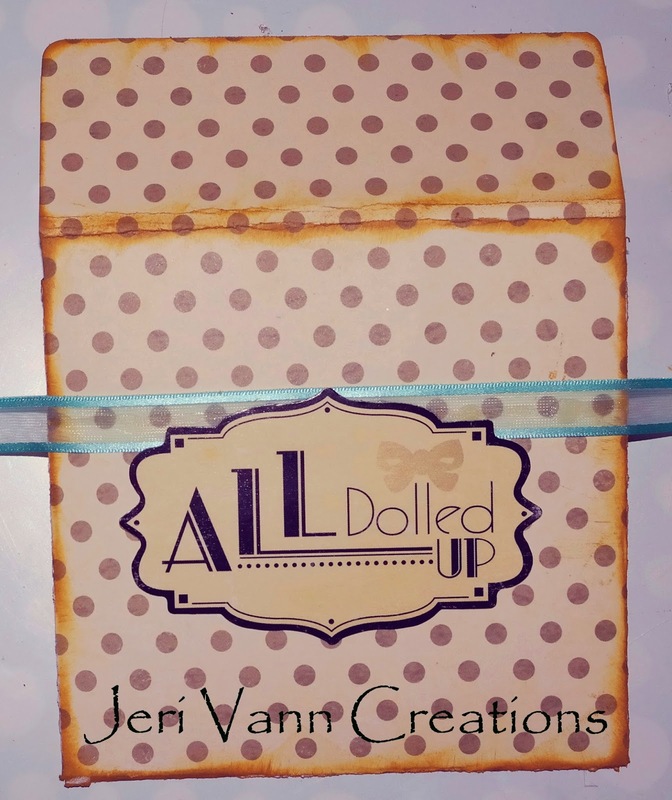 Make sure to line it up, so when it wraps around the back, it lines up with the top fold flap. 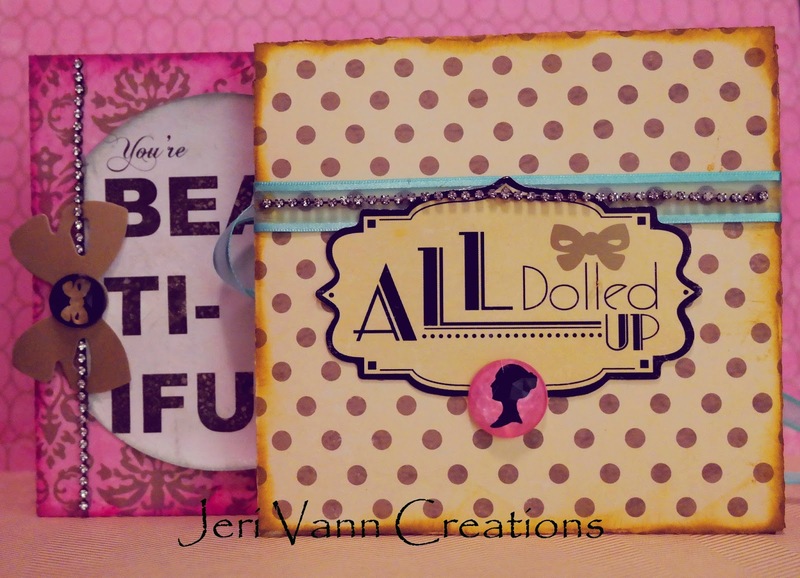 Secure the All Dolled Up Whatnots to the front of the card. 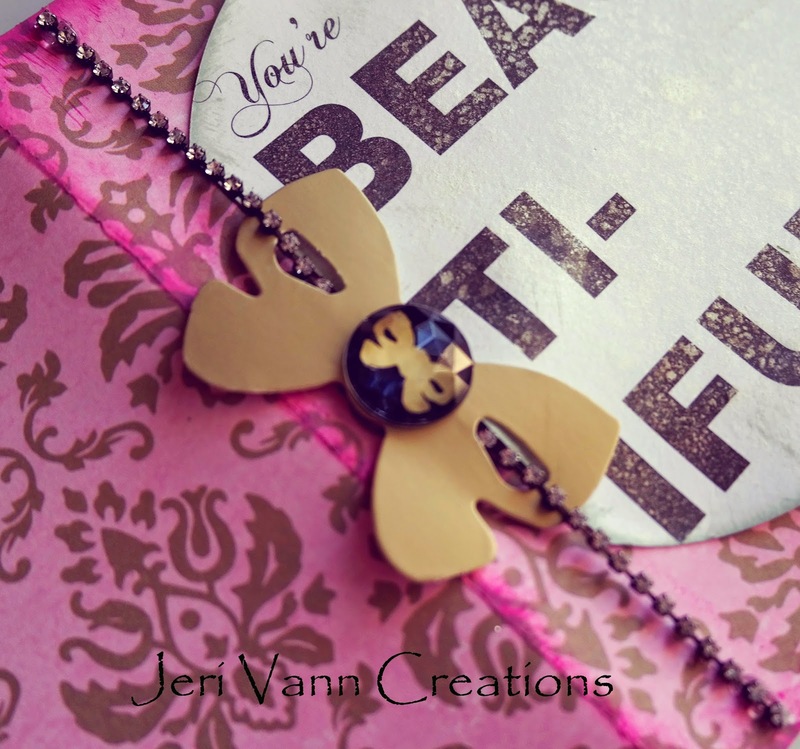 With the remaining part of the Rhinestone Strand, hot glue it across the front of the card, centered on the Ribbon. Hot Glue the Black Whatnots Bow on the top flap of the back of the envelope. Only glue the top half of the bow. 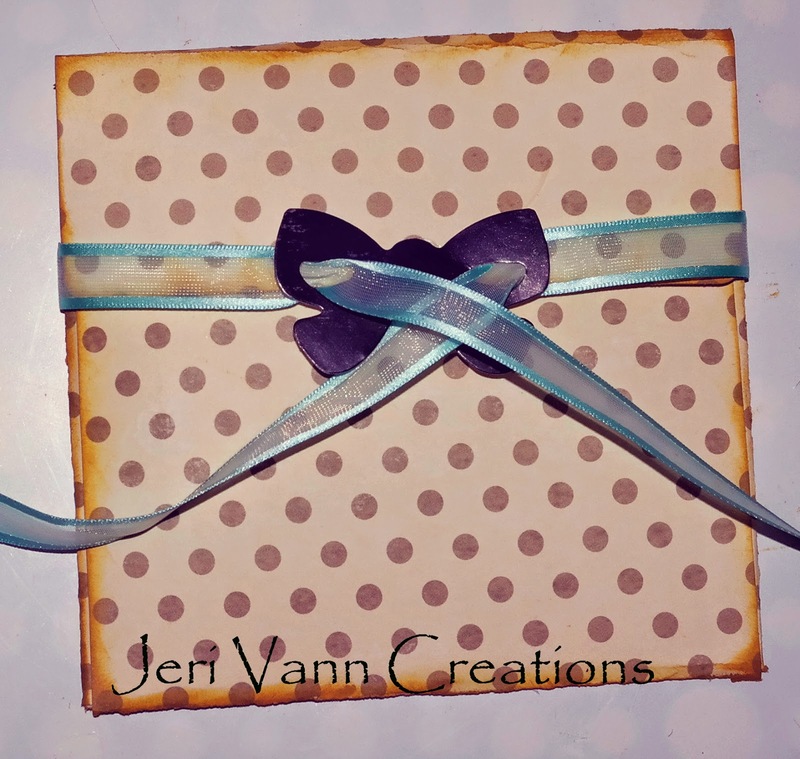 Slip the card inside and wrap the ribbon around the envelope, string the ribbon through the Bow holes and tie. 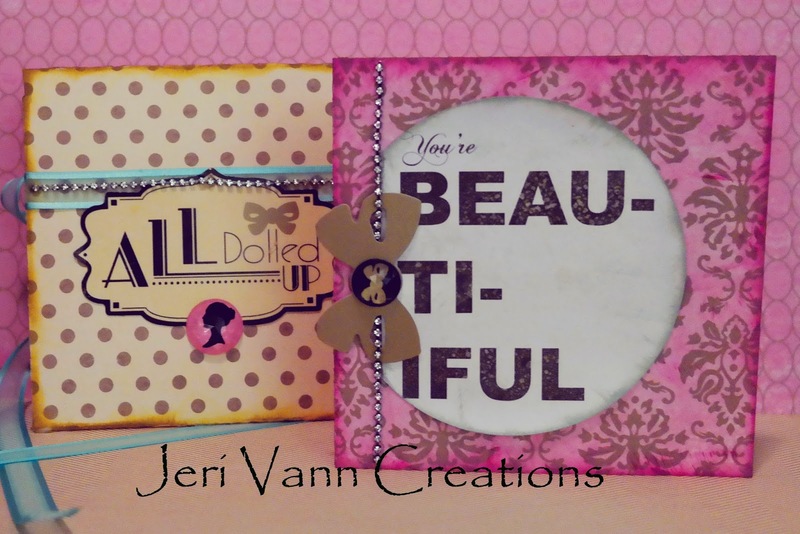 Your Card and matching envelope are finished!